Update: Nope, they eventually failed to find me a maid altogether and I settled for a refund. What a major waste of time. Summary: I was trying to get their ironing service. Booked since last week. But even till now they’re not here yet. I don’t usually write reviews but seriously, this experience really frickin pissed me off. If you’ve never used MaidEasy, here’s how it goes: When you book through the app, it doesn’t show you available dates – rather it’s an empty calendar and you just pick a time slot, and pay immediately. 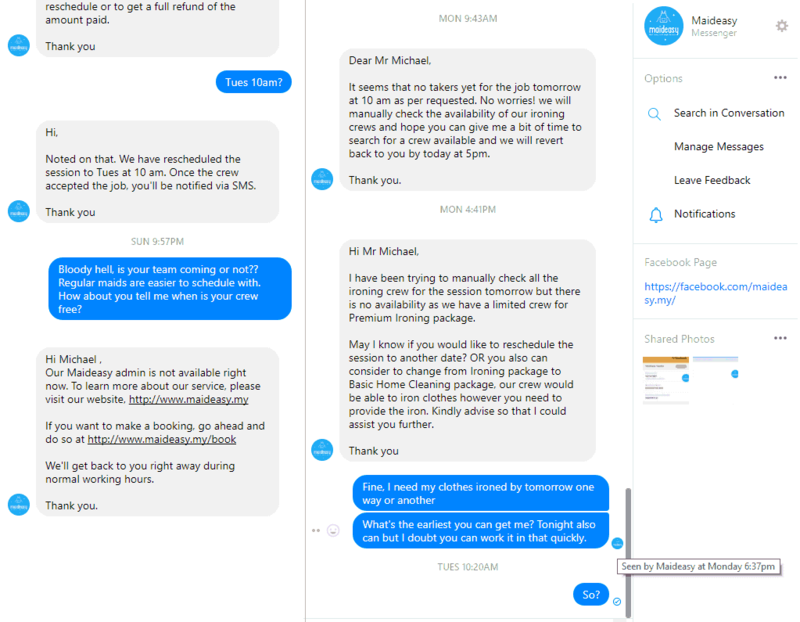 Then MaidEasy will shoot out the request to their crew and update you when someone takes it up. So on Friday morning, I booked for Saturday morning. 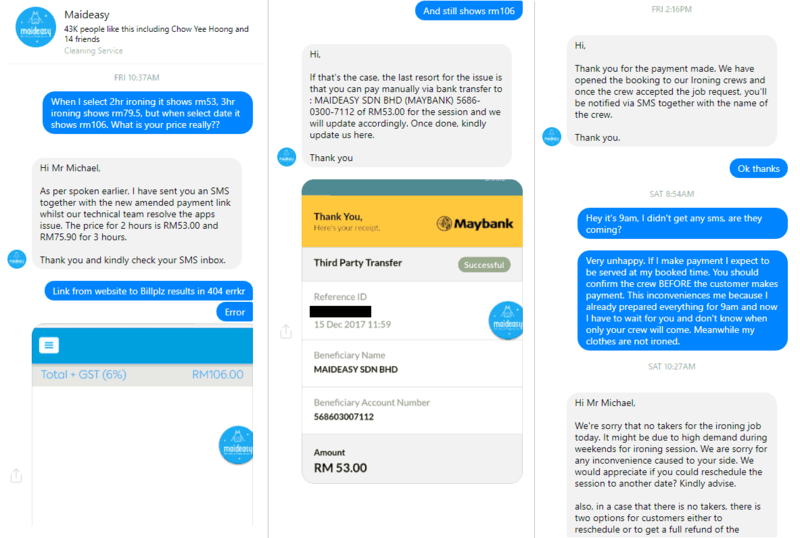 Payment problem – the service was listed as RM53, but at checkout it tried to bill me for RM106. Tried the website. Same problem. PM’ed via MaidEasy’s Facebook page. No reply. Called them, they said sorry and sent me a payment link via SMS. STILL the same problem. PM’ed via FB. Told me to do a bank transfer. Fine, done. Saturday morning, no update. Called them, they said none of their crew answered the request. They’ll manually try to find someone. Didn’t manage to find someone. So asked me to reschedule. Fine, I said Tues morning. They said they’ll shoot out another request to their crew and will update me if they find someone. Sunday night, still no update. PM’ed their FB. Monday morning, they said still no takers. Monday afternoon, asked if I could change to a regular maid service and just do ironing. I said fine, when can I get the maids? No reply to that, though FB reports my message was read an hour later. Today is Tuesday morning. STILL no update. Meanwhile my clothes that I painstakingly washed and dried in preparation for the service, is left unironed since Friday. I’ve just called their hotline and they didn’t update their system despite reading my latest message. So the customer service representative had no idea I was open to reschedule. If I didn’t call, they’d likely only reply later this evening. The heck is the point of FB Msgr if you’re not going to check it? So the representative said she’ll try to reschedule for 1pm and will update by 12pm if it’s successful or not. Let’s see how this goes. It’s not that I can’t iron my own clothes, but what the heck is the point of offering a service if you can’t deliver? Even more useless is a scheduling calendar that you can’t keep to. And collecting payment before you can confirm a date? I consider myself to be quite patient already but this is really no MaidEasy, rather maidbloodyhard. Their slogan – “Don’t stress, we’ll handle the mess” – yeah right, more like they’ll give you more stress and mess. It’s easier to just call one of those “normal” cleaning services and get them to come. They’re literally just one phone call away. Wanna try MaidEasy? Well, good luck.